Spinalonga – The Island off Crete. The island of Spinalonga (actual name Kalidon) lies just off the coast of the village of Plaka, near Elounda, Agios Nicholaos, in Crete. 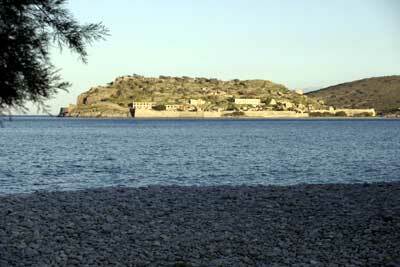 The name Spinalonga is Venetian meaning ‘Long Thorn’. It came to note in the year of 1579 when the occupying Venetians created a fortress on the island. Some years later when the Ottoman forces invaded Crete, Spinalonga was one of the places that they could not or would not take from the Venetians. So for 50 years after the invasion the island was still held from the Turks and came to be a centre for resistance against them. All supplies to the island came from the sea, one of the last outposts of the Venetian empire. In 1903 the Greek government turned the entire island into a leper colony. Cretans with leprosy left the caves where they had to live and came to the island of Spinalonga where at least they received medical facilities and a supply of food and social security. This was maintained until 1957 when once again the island became uninhabited. When I worked in Crete in the late sixties early seventies we used to take tourists to the island from the Italian Cruise ships docking in Iraklion. We used the theme of being ‘stranded on a desert island’ where we laid out tables of food and running barbecues for the tourists. My boss always told me never to mention that it had been a leper colony. It went very well until I had a break on holiday for a week when I came to Rethymnon and stayed in the government hotel there. Of course in those days under the Junta government the police knew where I had gone and could be located. The way that this trip worked was that we employed people with big speedboats to take the tourists out after they had alighted from their coach from Iraklion. We also employed people to set up the food and the barbecues as well as bringing them back to get on their bus to the cruise ship in Iraklion. This time that I was away, my boss had set up the trip. He employed the speedboats to take them out as well as the food and the barbecues. Unfortunately by lunchtime, what with all the friends he had in Agious Nicholas, he was pretty drunk and had forgotten all about the tourists. 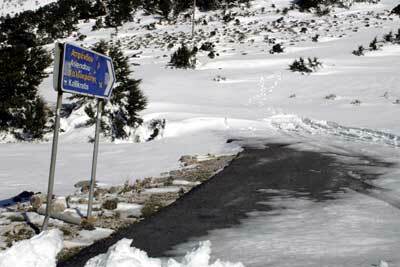 As evening drew in, I had a phonecall at my hotel in Rethymnon from the chief of police in Agios Nicholas. He asked if I knew that there were tourists on Spinalonga today and did I know that they were still there lighting fires on the pebbly beach to attract attention? I asked where my boss was and he said he had no idea. I asked him to tell the owners of the speedboats to get them off of the island back to their bus in Agios Nicholas. He said that it wasn’t his job to do that, so I pleaded and promised him a good night out. He agreed. It would take at least two to three hours depending on what happened to get them off and on the bus. I told him I would drive there as fast as I could. Next I phoned the port in Iraklion and told the purser of the cruise ship that they may be a little late but it wasn’t a problem. Then I drove like hell for Agious Nicholas. 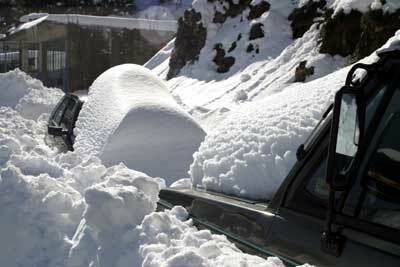 The national roads weren’t as they are today and I got there in around two hours and a half. That was a miracle. Truly a miracle. As I arrived at the Agious Nicholas port, the tourists were just arriving from the island of Spinalonga. Not on the super speedboats but on the coastguard ship. Whatever. I put them on the bus and asked the driver to get back to Iraklion port as fast as he could. If that cruise boat left Iraklion without them we were on penalty. I asked the chief of police why he used the coastguard? What else could I do he asked. We had the bill about a week later. Actually it was less than the speed boats. I followed the bus to Iraklion and welcomed the tourists as they came off the bus at the port. The general consensus was that they had had an amazing day – ‘the best time of our life’ one American said. ‘You know, we thought we were really stranded – incredible’. So we still had a load of tips from the tipsy tourists. We had certainly sailed close to the wind that day. But there were other days that were worse . . . The Island of the Damned; by Victor Zorba. The Island; by Victoria Hislop. For all those of you who responded to my last posting, here are the words of Joni Mitchell herself regarding Matala in Crete and the song ‘Carey’. 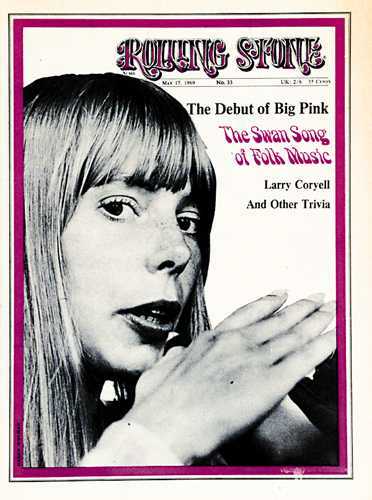 It appears that Joni was in Matala, Crete around 1968/69 – three years after 1966 when I went there and it seems that it had developed a bit from my time. . . .
“Matala was a very small bay with cliffs on two sides. And between the two cliffs, on the beach, there were about four or five small buildings. There were also a few fishermen huts. “The caves were on high sedimentary cliffs, sandstone, a lot of seashells in it. The caves were carved out by the Minoans hundreds of years ago. Then they were used later on for leper caves. Then after that the Romans came, and they used them for burial crypts. Then some of them were filled in and sealed up for a long time. People began living there, beatniks, in the fifties. Kids gradually dug out more rooms. There were some people there who were wearing human teeth necklaces around their necks,” she said with a slight frown. “We all put on a lot of weight. We were eating a lot of apple pies, good bacon. We were eating really well, good wholesome food. “The village pretty well survived from the tourist trade, which was the kids that lived in the caves. I don’t know what their business was before people came. There were a couple of fishing boats that went out, that got enough fish to supply the two restaurants there. “The bakery lady who had the grocery store there had fresh bread, fresh rice pudding, made nice yogurt every day, did a thriving business; and ended up just before I left, she installed a refrigerator. She had the only cold drinks in town. It was all chrome and glass. It was a symbol of her success. 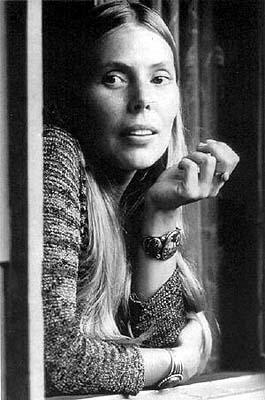 Then during a performance at The Troubadour, Joni introduced the song “Carey” with the following story (transcribed from the tape by Kakki). “I went to Greece a couple years ago and over there I met a very unforgettable character. I have a hard time remembering people’s names like so I have to remember things by association, even unforgettable characters, I have to remember by association, so his name was “Carrot” Raditz, Carey Raditz, and oh, he’s a great character. He’s got sort of a flaming red personality, and flaming red hair and a flaming red appetite for red wine and he fancied himself to be a gourmet cook, you know, if he could be a gourmet cook in a cave in Matala. And he announced to my girlfriend and I the day that we met him that he was the best cook in the area and he actually was working at the time I met him – he was working at this place called the Delphini restaurant – until it exploded, singed half of the hair off of his beard and his legs, and scorched his turban, melted down his golden earrings. Anyway, one day he decided he was going to cook up a feast, you know, so we had to go to market because like in the village of Matala there was one woman who kind of had a monopoly – well actually there were three grocery stores but she really had a monopoly and because of her success and her affluence she had the only cold storage in the village, too, so she had all the fresh vegetables and all the cold soft drinks and she could make the yogurt last a longer than anyone else, and we didn’t feel like giving her any business that day. Rather than giving her our business we decided to walk ten miles to the nearest market. So I had ruined the pair of boots that I’d brought with me from the city because they were really “citified” kind of slick city boots that were meant to walk on flat surfaces. The first night there we drank some Raki and I tried to climb the mountain and that was the end of those shoes. So he lent me these boots of his which were like Li’l Abner boots – like those big lace-up walking boots and a pair of Afghani socks which made my feet all purple at the end of the day and I laced them up around my ankles and I couldn’t touch any – the only place my foot touched was on the bottom, you know, there was nothing rubbing in the back or the sides – they were huge and he wasn’t very tall, either, come to think of it was kind of strange – I guess he had sort of webbed feet or something but we started off on this long trek to the village, I forget the name of it now, between Matala and Iraklion – and started off in the cool of the morning and by the time we got halfway there we were just sweltering me in these thick Afghani socks and heavy woollens and everything, so we went into the ruins of King Phestos’s palace to sit down and have a little bit of a rest and while we were there these two tourist buses pulled up and everybody got off the buses in kind of an unusual symmetry, you know, they all sort of walked alike and talked alike and they all kind of looked alike and they all filed over to a series of rubblely rocks- a wall that was beginning to crumble – lined themselves up in a row and took out their viewing glasses, overgrown opera glasses, and they started looking at the sky and suddenly this little speck appeared on the horizon that came closer and closer, this little black speck. Cary was standing behind all of this leaning on his cane and as it came into view he suddenly broke the silence of this big crowd and he yells out “it’s ah MAAGPIE” in his best North Carolina drawl. And suddenly all the glasses went down in symmetry and everybody’s heads turned around to reveal that they were all very birdlike looking people. They had long skinny noses – really – they had been watching birds so long that they looked like them, you know – and this one woman turned around and she says to him (in British accent) “it’s NOT a magpie – it’s a crooked crow.” Then she very slowly and distinctly turned her head back, picked up her glasses and so did everybody else and we kept on walking. Bought two kilos of fish which would have rotted in the cave hadn’t it been for the cats. Those of you who may have read my ‘Early Days’ stuff on this website will have come across my visit to Matala in 1966. Or you may have heard the stories from the days when this tiny bay became the hippie capital of Crete. Why it happened I don’t know, but the bay was truly beautiful. It has lovely fine sand and the cliff on the right as you look out westwards towards the sunset has a large number of roman burial places, effectively caves where you could stay if you had a sleeping bag. When I went there it was truly amazing. To have been through many cretan villages seeing only cretans, I washed up in this lovely place to see dozens of hippies just lying in the sun and enjoying themselves. Their colorful clothes a stark contrast to the cretans. There were one or two stone houses and a kind of cave church, but it did not seem that any locals lived there at all. There was a temporary taverna stroke bar that one of the cretans had set up on the beach and with some beers and some wine and a souvlaki barbecue he did very well. I remember that he also had an old Philips record player there that worked on batteries and he played LPs over and over. That was the Mermaid Cafe as everyone called it. Today there are hotels and rent-rooms establishments as well as tavernas and in the summer it is chaos. In the winter though, almost nobody lives in Matala. There are no cars and it is almost like it used to be, but no hippies, of course. Oh, and you are not allowed to sleep in the caves anymore. I never met anyone famous when I was there, but one of the people that spent some time in Matala was Joni Mitchell and she wrote her famous song Carey all about the place, the beach, and it always brings it all back to me. Don’t You Just Love Greek Television? I know that it’s a little after Valentines’s Day on February 14th but this clip from Giannis Kotsiras singing Stin Ygeia Mas in english is just right . . . . I was very pleased to get our olive harvest in and pressed when I did because this last cold snap just beggars belief. This morning the cat’s water that we leave outside was frozen solid. Two inches of ice in a place where we never hardly ever approach zero centigrade never mind get to minus four or five as we did last night. Yesterday it was snowing heavily and not only snow but largeish white pellets of ice were falling with some speed. Truly a horrible day and Sunday was no better. 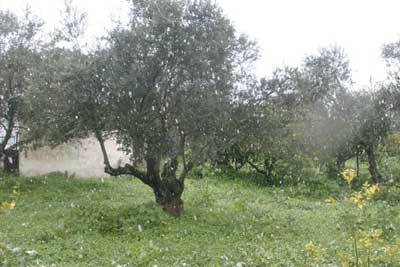 The snow you see falling around our olive trees was just the beginning. Later it got worse. Cars were being buried and the ice crystals were all over the roads. Most people got their wood burning fires going and stayed indoors. You can see here the result of the chaos with the buried cars and the icicles hanging from the building behind. 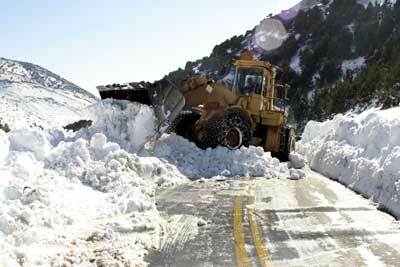 So they got to work with huge bulldozers, snowploughs and JCBs to clear the roads. Some however, like the one above that curves off to the left up the hill, were beyond them. It was hard and very cold work for the road clearers but I do admire the way that they stuck at what they were doing for very long hours indeed. Here is one of the big JCBs clearing the road in front of us. Quite a job. Thank God for raki – or tsikoudia as they call it round here. So to all those of you campaigning to prevent global warming, check out ‘this’ island in the sun.